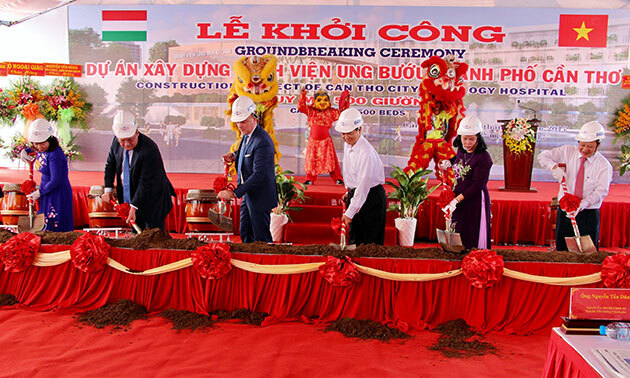 The groundbreaking ceremony was attended by former Prime Minister Nguyen Tan Dung and Szilveszter Bus, Deputy State Secretary of Hungary’s Ministry of Foreign Affairs and Trade. The Can Tho oncology hospital will include four buildings with a total floor area of 44,575 square metres on Nguyen Van Cu street, An Binh ward, Ninh Kieu district. The project has a total investment of 1,727 billion VND (70.5 EUR), of which 56.9 million EUR comes from the Hungarian government’s official development assistance. Mr. Vo Thanh Thong, Chairman of the municipal People’s Committee, highlighted the Government’s effort in improving the people’s health care and protection./.